My four-year old son has a new trick. He asks you to close your eyes and then sucker punches you in the tummy. The “trick” reminded me of what our elected representatives have been doing to us for years. Over the past year, we’ve witnessed both positive changes and more business-as-usual. I can’t claim the blog has done any good but I am sure of one thing – The next time an official socks us in the gut, our eyes will be wide open and the public won’t tolerate such abuse for long. As the year’s stats show, traffic peaked in April, sharply dipped in June after I forbade anonymous comments, and then matched April’s peak in December. Among the top ten articles, school related articles outnumber township articles by 2 to 1. Only three of the top ten were written in the later half of the year. The issue of school directors lacking a “director’s certification” was easily the biggest story in the past six months and is not about to die anytime soon. New information will be released in January and we still have to see whether any lawsuits or regulatory actions will be forthcoming. Once again, the least regarded story is that involving affordable housing. The town has granted zoning variances to a politically connected local developer to build unwanted and unnecessary housing despite the adverse impacts upon the community. Yet, my readership appears more interested in who’s using the handicapped parking spaces in front of town hall. By far, Dr. O’Malley represents the single biggest improvement to our district in the past year. For the first time in recent history, the school district has recognized its mission is academic performance and community service, not patronage. On the flip side, the township has been a series of disappointments. First Town Manager Brown’s resignation and then Councilwoman Gallo’s resignation. Meanwhile, pay-to-play is rampant and the back-door dealings continue. The biggest lesson of the year was the school board election. Jan Rubino, with the implicit endorsement and support of the teachers union, solicited campaign contributions from school staff. The scandal was largely ignored and she won in a landslide. The biggest question mark is BOE President Pat Demarest. She has a commendable record supporting Dr. O’Malley. In everything else, she’s been a terrible disappointment. From ethics, to academic achievement, to staff qualifications, to teacher qualifications, she has steadfastly maintained her position that the minimum legal standards, in all cases, are sufficient for our students and community. Yet, despite her low standards, she publicly opposed Dr. O’Malley’s appointment. Go figure. As for the blog itself, I am still well below my goal of reaching 5% of all households in Aberdeen. 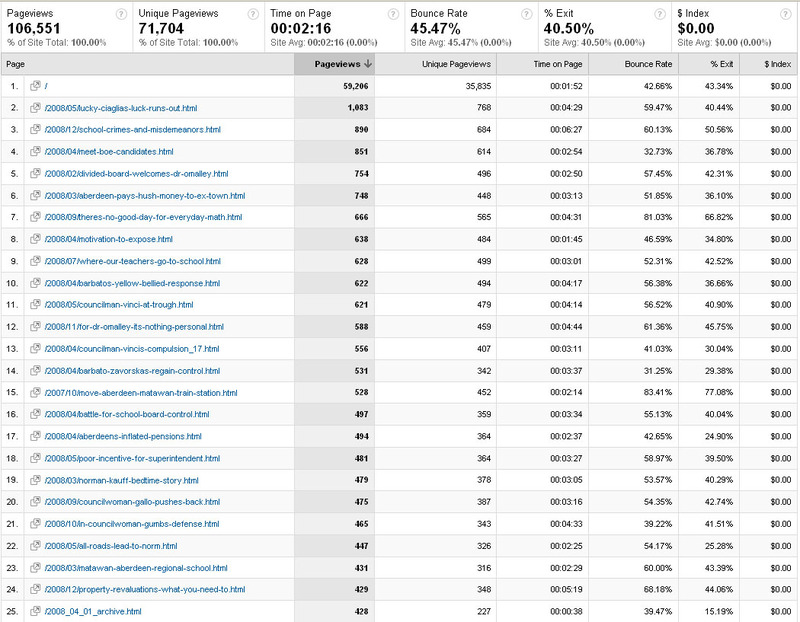 Excluding certain stories, Aberdeener.com often doesn’t pass the 3% threshold. I had assumed a natural organic growth through word of mouth. That hasn’t happened. In January, I plan to promote the site through a bulk mailing and provide a “Best of Aberdeener” page listing the choicest articles. One thing’s for sure – it’s no longer business as usual. More and more, officials are considering their actions’ consequences. Whereas before they could act fearlessly in the shadows, now they must tread carefully in the light. 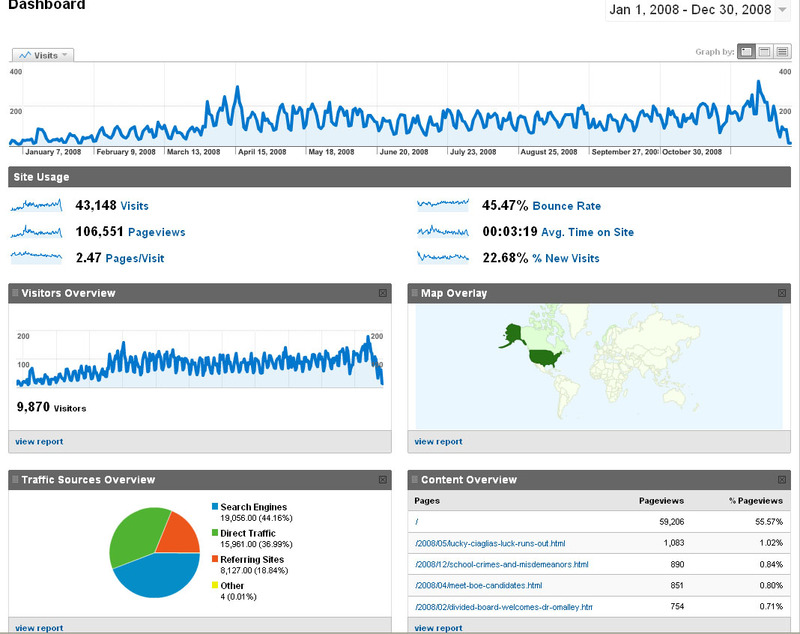 I believe the blog continues to do well and I thank my readers for their indulgence and support. I continue to hope the blog will become unnecessary. May everyone have a blessed year. >>> Read more! Once again, the public was right. After several postponements, the planning board granted unanimous approval to both projects on December 9th, which were then approved by the town council on Dec. 16th. Did the “powers-that-be” forget what they said a year ago or do they assume we’re too stupid to remember? Let’s compare what Aberdeen’s Town Planner, Richard Coppola, said in his September 24, 2007, review and the December 9th Planning Board meeting. Now: “A residential use is more compatible with what is already there in the neighborhood than commercial uses." Then: “The applicant proposes to construct 62 non age-restricted townhouse units . . .” (Page 4) Same as now. Planning Board Attorney Michael Leckstein, the attorney who will spare no taxpayer expense to pursue a groundless suit against a cell tower, supported the plan as well. According to Mayor Sobel, this is all to fulfill our COAH obligations. Well, there’s a far easier way to satisfy our COAH obligation – stop using inflated projections that are nearly 70% above the state’s estimates. According to Aberdeen's 3rd Round COAH Premediation Report, "Aberdeen was required to provide the most recent municipal population, household, and employment growth projections published by the municipality's MPO. The MPO for Aberdeen is the North Jersey Transportation Planning Authority (NJTPA)." Those numbers are 410 households and 310 jobs. 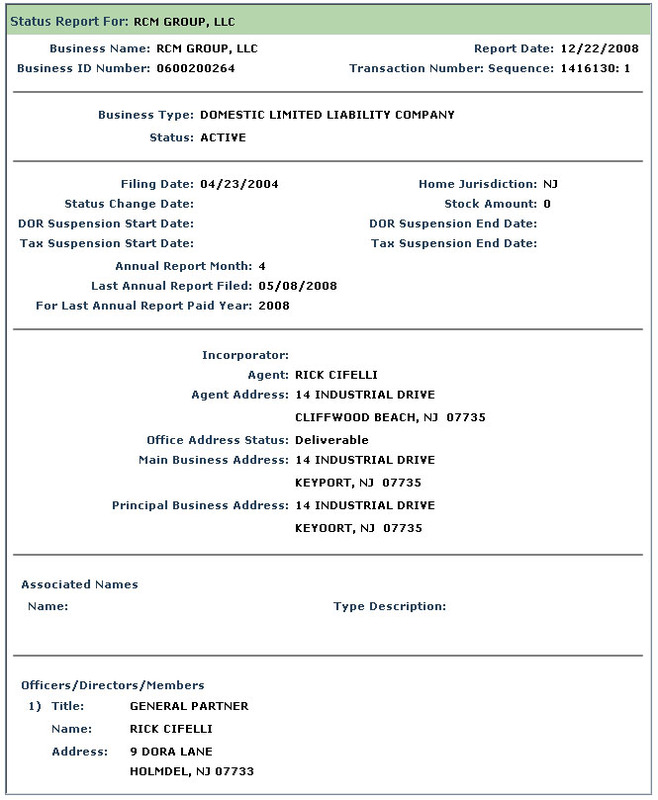 RCM stands for Rick Cifelli Management. Though I’ve not researched it, I’ve heard from multiple reliable sources that the property housing the old DMV office on Rt. 34 is owned by the Cifelli family. The DMV (now MVC) then moved to Airport Plaza, the property owned by Vic Scudiery (Monmouth’s Democratic Party Chairman). The rumor is that the projects are a “backdoor restitution” for the Cifelli family. Personally, I think it’s a bunch of backroom scoundrels wetting their beaks in the punchbowl before the party’s over. >>> Read more! As required by law, the Aberdeen Democratic Executive Committee has submitted three candidates for Councilwoman Gallo’s seat on the town council – two old-timers who won’t feel slighted by not being selected and one ace. No surprise whom will be picked. Congratulations to Fred Tagliarini on his upcoming appointment to the Aberdeen Town Council. The other two names, Henry Arnold and Irwin Katz, are respected members of the community but they lack the fresh face and name recognition that Fred Tagliarini has. Fred and his wife, Donna, make an attractive couple – friendly, athletic, and long-time community volunteers. Fred was recently re-elected Vice President of the Matawan-Aberdeen Babe Ruth League, where he’s been involved for nearly 20 years, and he sits on Aberdeen’s Planning Board. Donna participates in Monmouth County’s annual Outdoor Adventure Expo and some charity runs. The question is what kind of councilman will Fred Tagliarini become. I have high hopes. First, Tagliarini is well-respected in the community and nobody enjoys being bashed on these pages or in the town grapevine. Second, he never campaigned for the position; the party came to him, not the other way around. Third, the local Democratic Party is on a losing streak considering the resignations of Councilwoman Gallo and former Town Manager Stuart Brown. Fourth, anybody connected with town events has, at the least, a passing familiarity with the allegations on this blog and will be assuming the position with eyes wide open. Lastly, all good people want what’s best for our community and Tagliarini is a good man. Best of luck, Fred Tagliarini. Make us proud. >>> Read more! Although Councilwoman Gallo technically resigned from the Aberdeen Township council on November 8th, she had disappeared from the political scene after her heated opposition to the town’s budget at the September 2nd meeting. According to the minutes, Mayor Sobel pointedly asked her, “Do you want to be a member of this council or not?” Councilwoman Gallo responded “I do but I am not.” At issue – the township’s massive level of pay-to-play. One can only wonder at the level of pressure to force from office a councilwoman only eight months into her first term. Councilwoman Gallo was no stranger to the hard knocks of local politics. She was a founding member of the Matawan-Aberdeen Educational Foundation and then served six years on our school district’s board of education. After resigning her seat to Pat Demarest (currently the BOE President), Gallo later served on the Aberdeen Township Planning Board. When Councilman Minutolo was dumped from last year’s Democratic ticket (and subsequently became chairman of the Aberdeen Republicans), Gallo was recruited to run for council and garnered the second highest vote tally after Councilman Vinci. Yet, the moment she objected to the township’s pay-to-play, she was gone. Following the meeting, Mayor Sobel told the Independent “People get at pay-to-play with some of our hiring practices but we were one of the first municipalities to pass a pay-to-play ordinance.” Mayor Sobel’s statement was remarkable on two counts – First, the ordinance was passed just last year and only applies to developers, in particular Matawan’s chosen developer for the proposed transit village. Second, Mayor Sobel made the statement fully aware that virtually each of the township’s providers of professional services is also a financial contributor to the local Democratic party. The question now is what will happen next. Will the all-Democratic council appoint someone completely oblivious to local politics or will they find a “team player” wholly subservient to the party’s interests? Given the council’s record so far this year – the forced resignation of a popular town manager, a freshman councilwoman’s resignation while under fire, and the municipality’s largest ever tax increase – plus the upcoming shock from the property revaluations, the Democrats prospects for maintaining a monopoly in next year’s elections are looking dim indeed. On a final note, I'd like to thank Councilwoman Gallo for her service to our community and wish her all the best. >>> Read more! Congratulations to President-Elect Barack Obama. Across the country, America voted for the candidates of change and our neighborhood was no exception. In neighboring Matawan, Republicans Fitzsimmons and Urbano defeated the incumbent Democrats Malley and Bunyon on a promise to work with Mayor Buccellato. As for Aberdeen, the rumors are rampant that 2009 will represent a change of governance for our town as well. According to the grapevine, none of the township council members whose terms expire next year, Mayor Sobel and Councilmen Perry and Raymond, will be seeking re-election. These rumors have been ongoing for the past year but they appear to be gaining steam as the local Democratic Party readies a slate for next year. As for the school board, John Barbato (who tells me he won’t decide till early next year), is considered unlikely to seek another term as his youngest son graduates from high school this year. Under the recently approved, and state mandated, nepotism policy (page 32) there also won’t be any new district positions offered to close relatives of board members. Meanwhile, the Aberdeen Democratic Executive Committee may be polishing its image under Bill Shenton’s leadership. According to the committee’s latest filings, there have been zero contributions and zero disbursements in the last quarter. That means no pay-to-play contributions and no payouts to council members. Unfortunately, Councilwoman Gallo appears likely to resign her seat. During the last township meeting, Mayor Sobel made it crystal clear that she had been absent for three consecutive council meetings, the last two without prior notification. As for me, I will soon be announcing plans to publicize the blog and begin a grassroots campaign to organize like-minded folk. I will not be creating a new party but rather try to establish a large enough base to force the existing parties to seek our support. Our best days lie ahead and I’m eager to move forward. May God bless our country and give our leaders the wisdom and strength to lead us into a brighter future. >>> Read more! Click here for a copy of the 2007-08 audit. For those wondering if elections matter, here’s more evidence they do. Following Dr. Gambino’s election to the Matawan-Aberdeen school board in 2007, the standards wing had a one-vote majority that disappeared the following year with Ken Aitken’s defeat. But, during that one year, they appointed two senior administration officials – Dr. Richard O’Malley as superintendent and Ms. Susan Irons as business administrator. Dr. O’Malley and Ms. Irons were both outsiders with no connection to the community or any senior member of the school district, a precondition for their consideration. Though we won’t know the impact on test scores for another year, the recent financial audit was startling – the Matawan Aberdeen Regional School District has cleaned its books. As Dr. O’Malley states in his introduction, “The 2007-2008 auditors' management report reflects the successful implementation of the corrective actions, as the number of auditor recommendations decreased from eighteen to six.” (Page 11) More importantly, every finding from last year’s audit was rectified. To capture the full scope, compare this year’s audit to the prior year’s findings. (Page 158) Last year, in a sample test of 60 purchase orders/vouchers, 7 had blanket orders, 9 vouchers were not encumbered, 2 lacked supporting documentation, 2 were from the year before, and 1 lacked a date of receipt. All this from a sample of just 60 PO’s and vouchers. Other findings included late payments, inaccurate financial reports, missing documents, non-current records, accounting discrepancies, and a failure to follow state guidelines. The audit was performed by Robert A. Hulstart and Company, a firm with no known relationship to anyone on the school board or administration except that Ms. Irons had worked with them once before. By contrast, Aberdeen Township has a decade-long relationship with its auditor who’s also closely tied to the Monmouth Democratic Party and maintains an office in Vic Scudiery’s Airport Plaza down the hall from Norman Kauff. Still, the report wasn’t all roses and sunshine. Simply put, we don’t have the money to cover both operating expenses and building maintenance and the problem will get worse unless we restrain spending. Another sore spot is the $36.8 million dollar debt service that was approved by referendum in late 2002. A substantial portion of the money went to the construction of 17 new classrooms. As can be seen on the capacity/enrollment chart (Page 132), from the day the extra classrooms were built, they were never needed – not one. The high school also has surplus capacity of 31% but all of the elementary schools, save Lloyd Road, are at or above capacity. Considering the student population has been remarkably stable for the last several years, it seems these construction projects to add extra capacity had something other than the students’ needs in mind. As for this year’s financial audit, congratulations to Dr. O’Malley and Ms. Irons on a job well done. Let’s hope the district does as well on the educational side of the scorecard. >>> Read more! I am proud of a country that gives you the right to speak out on issues that affect you. I will, however, call you on the facts regarding the comments you made about Councilwoman Gumbs’ family. From your tone, you must be a transplanted citizen or just very bitter. Here are some actual facts: Wilhelmina Gumbs has been married to George Gumbs for 50 years next week. George Gumbs was the Director of Labor for the state and employed some 39 years there (with a master’s degree). He is a member of the Matawan Aberdeen Hall of Fame. She only has 2 children – Wanda, who has been married for 20 years and also works for the dept of labor, and me, her son, Wendell Gumbs. I was a member of the council from 96-99 before moving to south jersey with my wife and 3 girls. Not to mention my late uncle Phillip Gumbs, a former Freeholder Director of Monmouth County and supervising judge. His daughter, Robina Shaw Esq., was just inducted into the same Hall of fame last week-end. The only reason I am taking time out to write this response, is because I don't know who you are to confront you face to face. If you have issues you disagree with, that's fair game. My issue is your blatant disrespect and the straight out lies you are now posting about my family. I would ask that you at least get your facts straight before posting things that are just not the case. If you would like to discuss this matter in person, please let me know. Wendell Gumbs served on the Aberdeen Town Council from 1996-99 >>> Read more! Are our schools safe? The answer is “Compared to what?” Although crime statistics in schools are notoriously unreliable (not every incidence is reported), New Jersey does track the number of criminal occurrences within each school, whether or not a police report is filed. On average, our schools are a bit safer when compared to New Jersey or Monmouth County as a whole. However, when compared on a district by district basis, Matawan-Aberdeen doesn’t fare as well. As the table below demonstrates, even including last year’s blip, our district’s rate of criminal conduct is below the county rate. Yet, out of 56 school districts, we rank just below the halfway mark. Obviously, any level of criminal conduct is too high but I don’t have an answer to reducing it. Many parents feel that kids should be allowed to rebel a little bit, from outlandish dress and hairstyles to the “harmless” joint. Coupled with the fact that some students come from unhealthy home environments, there’s sure to be some level of misconduct. Still, I have to believe we can do a better of creating a safe environment for our children. >>> Read more! Are we witnessing Matawan Borough’s final days? Despite (or perhaps because of) having the highest tax rate in Monmouth County, Matawan is on course for financial ruin. After raising the budget by 13%, the borough still had a $160,000 shortfall that may yet increase before the year has ended. Mayor Buccellato called for across-the-board cuts but got nothing. Instead, he was left crowing about the two hundred bucks Matawan saves each week by closing borough hall on Fridays. Matawan is too small to survive as an independent municipality. As the following table demonstrates, Matawan’s bigger sister is nearly double the borough’s size in every respect but one – Aberdeen’s tax levy is only 20% higher. According to Monmouth County’s published overview and economic statistics, Aberdeen isn’t only larger, but its per household income (based upon the 2000 census) is also 7% higher. Aberdeen’s outlook is brighter as well because it has far more undeveloped areas – the area around the train station, Anchor Glass, and Aberdeen Forge. Matawan’s municipal tax rate is about 55% higher than Aberdeen’s. Yet, Matawan has a police station in disrepair, a dilapidated courtroom, a shuttered water plant, a history of late payments to municipal workers and the school district, and an inability to fully maintain its roads and sewer. As for Main Street, it’s time to give up the ghost. The area needs a rehabilitated Main Street but the borough council clearly lacks the political will to make it a reality. Two years ago, Councilman Mullaney had pinned his hopes on C-Town. “"It will prove to be the best thing that has happened to downtown Matawan in I don't know how many years," Councilman Mullaney said. "It's phenomenal; it will certainly start the revitalization of downtown Matawan . . . The people of Matawan will be pleased. Not should be - will be." Well, we know how that turned out. Meanwhile, Governor Corzine is determined to close all municipalities with a population below 10,000 by slashing their state aid and pushing them to save money through shared services; not a single municipality can survive without state financing. As for merging Matawan and Aberdeen, Mayor Sobel has one question – What’s in it for us? However you define “us”, it’s a fair question. I believe the math and politics of a merger strongly favor both municipalities but Matawan has never tried to persuade Aberdeen of the benefits. So, what now? I’d advise Matawan to seek a “government bailout”; pursue state incentives to entice Aberdeen to merge with Matawan and then sell, sell, sell. Bypass the town council and speak directly to the people - Matawan and Aberdeen can achieve far more as a single town. Do I believe that is about to happen? No. More likely, the borough will continue to decline, possibly skirt bankruptcy, and ultimately be forced by the state to merge with another municipality. Now is the best time for Matawan and Aberdeen to merge. Any way you look at it, it’s a good deal for the people of Matawan and Aberdeen. >>> Read more! Though I’m reluctant to write about any topic that does not directly pertain to our neighborhood, the market crash demands attention. Whereas greed has always been with us, the latest meltdown has been brought to us by the government. Now, the same bureaucracy that brought down Wall St. is promising to fix the mess they created with more oversight, more regulation, and more spending. Haven’t they done enough? Though this recipe for disaster has many ingredients, the story begins in 1977 with the Community Reinvestment Act (CRA). Banks had long been accused of redlining - refusing to conduct business or grant loans in certain neighborhoods. The CRA allowed the federal government to consider a bank’s involvement in minority and low-income neighborhoods when reviewing the bank’s application to expand through acquisition, merger, or branching. Over the years, especially in the 1990’s, the CRA was strengthened to ensure that banks continued lending to low-income neighborhoods. The CRA became especially important after the Glass-Steagall Act was repealed in 1999; the Depression-Era statute had forbidden commercial banks from doing investment banking. The next ingredient came in 2001. Following the dot-com bubble bursting, a minor recession at the end of 2000, and the 9/11 terrorist attacks, the Federal Reserve, fearing deflation, adopted an easy money policy and dropped overnight rates to 1%. In 2002, Ben Bernanke (then a member of the Board of Governors of the Federal Reserve) earned the moniker “Helicopter Ben” by referencing a Milton Friedman idea that the government could fight deflation by dropping bags of money from helicopters. The Federal Reserve, however, made a mistake in focusing too much on core inflation, the rate of inflation excluding food and commodities. The rising global economy, coupled with increased trade, put downward pressure on prices despite the rise in commodity prices (gold, oil, construction materials, and agricultural products). 2001 was also the year of the Enron collapse. IRS regulations required the use of Mark to Market, evaluating marketable assets by the closing price on the last market day, but many of Enron’s assets were in illiquid markets so they used Mark to Model. Enron inflated profits by exaggerating asset values and hiding billions of dollars in losses through off-book accounting. Enron’s senior executives were convicted of fraud and its accounting firm, Arthur Andersen, though ultimately acquitted, was shut down. Still, Congress insisted on passing new legislation to prevent another “Enron”, hence the Sarbanes-Oxley law which strengthened accounting standards and imposed severe criminal liabilities for non-compliance. Mark to Market became the rule of the day regardless of market conditions. The final ingredient for catastrophe was Fannie Mae and Freddie Mac. These government sponsored enterprises (GSEs) were created to establish a secondary market for home mortgages, thereby enabling banks to make more mortgages. Since the GSE’s had an implied government guarantee against default, they were able to borrow more money more cheaply than anybody else. And borrow they did, buying over $1.5 trillion in home mortgage securities. However, following Enron, Fannie Mae’s and Freddie Mac’s auditors decided to review the books a second time and found them in non-compliance. In 2003, Freddie Mac was found hiding billions in profits to smooth earnings from year to year. In 2004, Fannie Mae was punished for hiding $9 billion in losses. The SEC’s chief accountant, Donald Nicolaisen, told Fannie Mae’s CEO, Franklin Raines, to imagine compliance as the four corners of a page with perfect compliance in the center. “You weren’t even on the page”, he told Raines. In 2003, the White House, Alan Greenspan, and Congressional Republicans began sounding the alarm that the GSE’s had grown too large, had accumulated too much debt, and were posing a serious risk to the country’s financial system. The GSE’s fought back by championing affordable housing and flooding congressional allies with financial contributions. (During Senator Obama’s short tenure, he was Congress’s largest recipient, taking over $126,000 in campaign contributions. Chris Dodd, Chairman of the Senate Banking Committee that oversees the GSE’s was the all-time largest recipient at $165,000 over a 20-year period.) Fannie and Freddie weren’t allowed to purchase sub-prime loans but they were allowed to pour hundreds of billions of dollars into the securities backed by sup-prime loans. Any check on their purchases would have limited their ability to support affordable housing. At the same time, Countrywide, the country’s larges originator of sub-prime loans and Fannie Mae’s poster boy who accounted for up to 30% of the loans purchased by Fannie Mae, began its “Friends of Angelo” program, named after the CEO, Angelo Mozilo. Senator Chris Dodd and other senior congressmen were offered a “V.I.P.” program that waved “points, lender fees, and borrowing rules”. Facing strong democratic opposition and a tough election year, Republicans retreated. Our cake is now complete. Banks, encouraged by the CRA, began making sub-prime loans. Fannie and Freddie, backed by an implied government guarantee and seeking to justify their government support, bought huge blocks of securities backed by sub-prime loans, thereby encouraging banks to issue even more risky loans. Low interest rates heats up the housing market, encouraging homeowners to use their newfound home equity like a checking account. And an inflexible mark to market rule that no one seems to notice. All we have to do is wait for something to go wrong. As commodity prices kept rising, the fed began to slowly raise its rates. Despite prevailing wisdom on Wall St. that higher interest rates would end the housing boom, few analysts predicted a housing bust because of the low unemployment rate. Unfortunately, they discounted the types of home loans being taken. Many of the loans were non-amortizing low-deposit, adjustable rate mortgages with teaser rates. (The teaser rates had two purposes – to entice borrowers into larger mortgages and to meet Fannie/Freddie standards which only used six month projections.) In other words, not only would many homeowners be facing sharply higher mortgage payments but they would also be “underwater” since their homes were worth less than the mortgages. In fact, nearly one-third of Countrywide’s loans were negative-amortization loans, meaning the initial payments weren’t even covering the interest on the loan. Sure enough, default rates shot upward but, even at today’s 6% default rate, the defaults should have been well within the financial industry’s capability, especially considering the mortgages are backed by homes and notes. The problem wasn’t in the default rate but in the industry’s inability to price the mortgage-backed securities. Pools of home mortgages would be packaged into securities. Those securities would then be sliced a thousand ways. One security covered the interest payments. Another covered the principal. Then the securities were ranked according to who got paid first in the event of default. Then they were priced according to risk. Bamm! The financial industry couldn’t price risk. First, FICO scores were no longer reliable predictors because default rates were more closely aligned to the equity in the house as even borrowers with good credit histories began to default. Then, certain areas such as Las Vegas and Miami saw housing prices plummet far faster than other areas, but the securities were bundled according to borrower’s credit risk, not the risk in falling housing prices. Then politicians jumped into the fray. Some sheriffs declared they wouldn’t foreclose on homes during the current crisis. Senator Hillary Clinton called for a rate freeze on adjustable rate mortgages. Lastly, some banks were having difficulty foreclosing because mortgage filings with the county weren’t up to date. Securities are traded at the click of a button but only the recorded holder of a mortgage can foreclose on a house. Suddenly, mortgage-backed securities, especially sub-prime mortgages, were “toxic”. Nobody wanted them and the market dried up. Remember the Mark to Market rule? Well, how do you price a security in an illiquid market? Answer is same as you do for a liquid market – based on the price of the last sale. To illustrate the problem, imagine a local homeowner has a gambling problem. One day, some large fellows with no necks explain to him that he only has a week to settle his debts or he may encounter complications. The homeowner is forced to sell his house at distressed prices, far below market value. Unfortunately, under Mark to Market rules, the bank is forced to value all properties based upon the latest sale. They immediately contact a local developer and inform him that, based upon a recent sale, they’ve had to reappraise his property for far less and the developer needs to pay down his debt or they’ll foreclose. That developer becomes a distressed seller and the trend continues. Same story in the mortgage backed securities market. Between the housing market crisis, unreliable risk predictors, and potential government intervention, the mortgage backed securities market dried up. But there’s always somebody in need of cash and they were forced to sell their securities at reduced prices. The moment they did, every company had to mark down the values of their own securities. Suddenly, they no longer had sufficient capital to support their leveraged investments and they were forced to liquidate more of their holdings at further reduced prices. Once the dust began to settle, financial companies such as Merril Lynch and AIG had marked down their securities by nearly 80%. According to Fitch Ratings, as many as 45% of adjusted rate mortgages (ARMs) could default but the paper is backed by real property. Even assuming you only get back 50% of the mortgage value from foreclosing on the house, that still only translates into a 22.5% loss. Why then are companies being forced to writedown 80% of the value? If these securities are such great bargains, why aren’t other companies taking advantage? Because most financial companies make their money by using highly leveraged positions. Imagine you buy these securities at a great buy and then some other company sells them for less, forcing you to mark down the securities. The paper loss could render you undercapitalized and force you to liquidate other holdings. Nobody wants to risk being placed in that position. Mark to market accounting has resulted in the deaths or takeovers of Fannie Mae, Freddie Mac, Bear Sterns, Merril Lynch, Lehman Brothers, AIG, IndyMac, Wachovia, Washington Mutual, Countrywide, and New Century Financial. Many of these companies deserved to die for creating outrageous mortgage instruments and not providing sufficient warning to borrowers but the massive wreckage across Wall St. is unwarranted. In summary, we have an unbridled Fannie Mae and Freddie Mac earning private profits by assuming public risk. They create a market for sub-prime loans by purchasing their securities. Financial companies begin offering unconventional and risky loans that many borrowers didn’t even understand, all in the name of affordable housing. When interest rates ultimately rise, housing prices drop and mortgage defaults increase to alarming levels. The securities market dries up and financial companies are forced to revalue their assets according to an accounting rule that has no rational basis in an illiquid market. The result is a worldwide financial crisis, a trillion dollar bailout, and more unwanted government intervention. No matter how often government creates a crisis, the public turns to the government for the solution. The answer is less government, not more. Shut down Fannie Mae and Freddie Mac. The companies are no longer needed and the federal government can’t be trusted to run them. Establish triggers for declaring an illiquid market. During illiquid markets, companies can value their assets according to Mark to Maturity rather than Mark to Market. Grant securities backed by mortgages for primary residences the same tax exempt status as municipal bonds. Mortgage rates would drop, home prices would rise, and the refinancing spree would revitalize the banking industry. Restrain executive pay. All senior executives should have their compensation packages approved by a shareholder vote. If the owners want to overpay their CEO, that’s their business, but compensation packages shouldn’t be determined by a board handpicked by the CEO. Modify Regulation Z – Borrowers should be provided worst-case-scenarios over a 10 year period for all non-commercial loans. Aside from the idea for tax-exempt securities, the above ideas have already been proposed by folk far more knowledgeable and influential than me. My goal is to simply refute the idea that our government is being run by uber-geniuses, that the market failed because there was insufficient government oversight, and that the answer is more government. We don’t need monster bailouts, needless government interference, or market manipulation. Changing a few simple rules and protecting the integrity of the marketplace is all the government needs to do. >>> Read more!